Online shopping fails: the best of the internet. 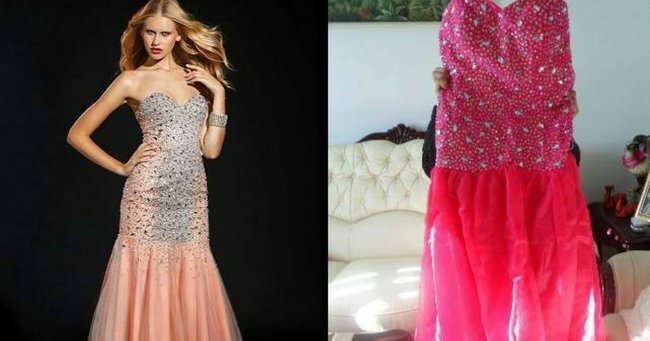 Women share their worst online shopping fails, and they are terrible. When I was 17 and in year 12, I bought my Year 12 formal dress online. Whether it was an issue of not wanting to physically go shopping or not having time to, I don’t necessarily recall. But I do remember that it wasn’t a particularly clever decision. Especially when you accidentally order your dress in US sizing. So there I was, 17 and unaware that the dress I had just bought online was about 6 or 7 dress sizes too big for me. It wasn’t until it came that I realised the mistake I had made. And believe me, no matter how much time you spend looking at a dress, willing it to fit you, it will not fit you when it’s 6 sizes too big. And now I’ve finally found some people who feel my pain. Because although my situation was entirely self-inflicted, I understand that ordering something online and it not arriving and not resembling an ounce of what you thought it would can be quite the ordeal. Behold, the women creating Facebook groups to share the pain of a purchase that doesn’t quite go to plan. So, we make one bad scenario a good one. Their pain is your entertainment. Image via Knock Off Nightmares/Facebook. Tempted to actually go shopping? Watch Mamamia&apos;s Managing Editor get a fashion makeover.